By purchasing this ticket and attending the event you are agreeing to the use of your child/child's image or likeness for website/advertising purposes only. FAOPA has instituted policies and procedures to combat bullying and bullying behavior, which may include but not be limited to name calling, harassment of another student causing physical or verbal harm, and any negative behavior that is repetitive and intentional. While FAOPA will not tolerate bullying of any kind, all incidents will be evaluated individually to determine a resolution. If any incident warrants the removal of the child from the program, we will not issue a refund and special consideration will need to be made to allow the child to participate in future FAOPA programs. Are you an existing student? 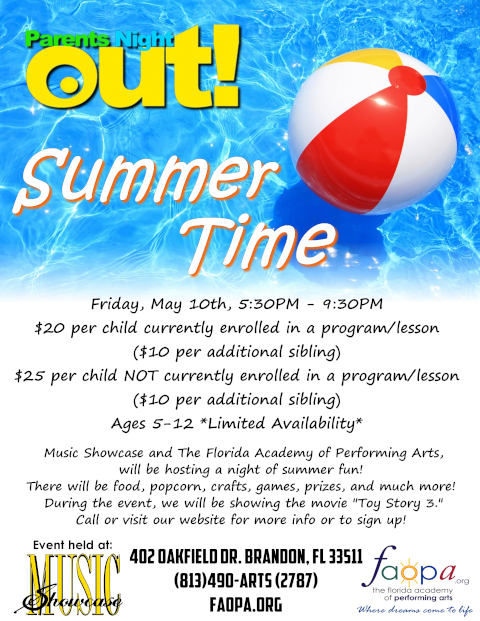 Are you currently enrolled in lessons at Music Showcase or a FAOPA program?